One of life’s greatest disappointments, is time lost. We seldom take the time to stop and appreciate the important things in life, and sometimes a special moment passes by without getting the attention it deserves. Life is imperfect, but it is filled with perfect moments; moments you wish you could celebrate forever. Our philosophy is about creating remarkable diamond and tanzanite jewellery designs, inspired by the special moments in people’s lives. Moments that are re-lived each time the receiver catches a glimpse of their precious work of art, given to them by the one they love. Whether it’s celebrating an engagement, a birthday, an anniversary, or a surprise spoil because a loved one deserves it, we understand how important and how valuable these special moments are. These moments are the reason for our existence, and that inspire us to innovate and create beautiful jewellery. Create your own milestone by choosing one of our beautifully designed jewellery creations to create lasting memories. With value that will reward for a lifetime, a jewellery creation can be passed to the next generation as an heirloom, and will appreciate as time goes by. A beautiful creation of jewellery worn, is a constant reminder of a memory, and allows one to relive the moment over and over again. We realise the importance of helping our customers find a piece of jewellery that perfectly captures the essence of their moment, reflects their love and personality, and suits their occasion. It is a pleasure and an honour to be a part of this emotionally-rewarding journey, and we take pride in guiding you to find the perfect piece of jewellery for your unforgettable moment. A jewellery creation lives forever, making it the perfect gift to reflect meaning and emotion. There is more to jewellery than a beautiful design, and it is the way it makes you feel, that gives it its true value. A diamond’s journey from deep within the Earth’s core to the surface of the Earth takes over 3 billion years. Once it is mined, it is transformed by a unique combination of modern technology, exceptional craftsmanship and design excellence into a unique jewellery creation that will capture your heart. 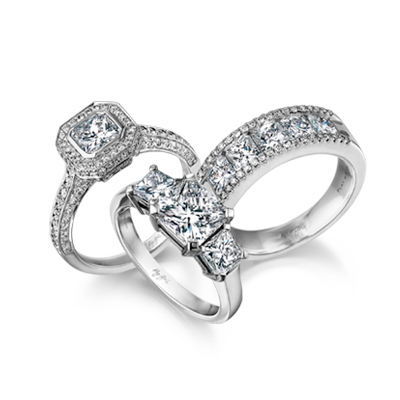 Perfection takes time, and we don’t rush to take a diamond’s journey to the very end. South Africa is blessed with natural resources such as gold, platinum and diamonds. With a combination of creativity, passion and innovation, we constantly engage in creating beautiful jewellery creations, using these resources. Our unique designs are distinctive in their own right. No two diamonds are alike and; just like people, each diamond has its own distinct characteristics. These characteristics translate into a unique energy and design language that cannot always be understood, but can be felt by the one who falls in love with it. Each Shimansky designer jewellery collection tells its own unique story: from the iconic Millennium Engagement Ring that became the most coveted ring in South Africa, to the spellbinding My Girl Diamond collection, which was the first international diamond cut patent to originate from South Africa. Shimansky creations need to be experienced and seen in real life to be appreciated for what they are. Finding a magical design creation is a true test of the heart as it’s not always understood why we fall in love. Finding a way to appreciate someone special in your life can be challenging at times. It can sometimes even be a daunting task. While browsing through Shimansky’s wide selection of jewellery design creations, you will find what your heart desires. Passionate and dedicated Shimansky team members educate and guide you through your journey of discovery, so that you can make an informed decision when finding the creation that speaks to your heart. A special jewellery creation is designed and crafted just for you in collaboration with our in-house design team, where the piece will be crafted on our premises, to its maximum beauty. As a Shimansky client we are delighted to assist you in keeping your jewellery looking its best. Bring your jewellery creation to us at any given time for complimentary refreshing. It is recommended to visit us once every six months to ensure the best maintenance of your jewellery. The experience of selecting a jewellery creation should be as special as the moment it represents. Shimansky diamonds are graded by international, independent diamond laboratories such as the Gemological Institute of America (GIA) or the European Gemological Laboratory (EGL). Each diamond comes with a Certificate of Authenticity, and all Shimansky diamonds and Tanzanite are conflict-free and ethically sourced. Shimansky diamonds are mined directly from South African mines, assuring your peace of mind. We stand by the quality of the jewellery we provide you, and guaranteed, through your lifetime, is that what you purchased, is what is stated on your diamond certificate. All diamonds are graded, and adhere to the international diamond grading standard. Most diamonds over 30 points, and all diamonds over 50 points, are accompanied by a diamond certificate. Diamonds equal to (or larger than) 50 points in weight are laser-inscribed with a unique diamond identification number on its girdle, in letters no larger than a few micron. A Shimansky creation only shows its true value and potential when it is worn by the one it was meant for. It is important that you treasure the memory of your special moment as much as you treasure the jewellery creation that brought it to life. Finding the perfect jewellery creation that reflects your taste, symbolises your love and mirrors your relationship is an emotionally rewarding experience – one that Shimansky is delighted to guide you on. If you don’t find a jewellery creation in our existing collection that speaks to your heart, our in-house bespoke design and manufacturing team will assist you in designing something special. A Shimansky jewellery creation holds the precious memory of the day it was received: a reminder of the joyous occasion from which it stemmed, to be enjoyed until the end of time.